What’s The Harm In Leaving My Pet In The Car? Well folks, it’s that time of year again when we want to remind you to NEVER leave your pet in the car unattended! It doesn’t matter if you just need to grab one item from the store or if you think your pet would be happier waiting in the car than waiting at home. In the summer, cars quickly heat up and can act like an oven. 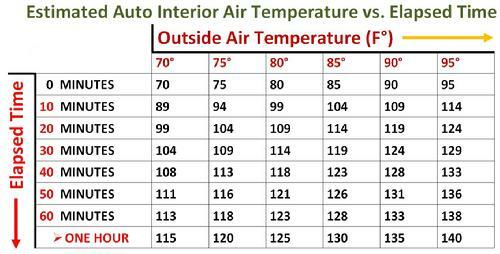 Studies have found that in just 10 minutes, the temperature inside a car can rise by nearly 20 degrees! After 60 minutes, the temperature can increase up to 40 degrees. That means even on a moderately “cool” 70 degree day, the inside of the car can be as hot as 110 degrees! Cracking the windows does not help. 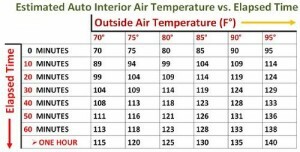 Studies show that the temperature inside a car with its windows cracked are the same or very similar to the temperatures inside a car with its windows rolled completely up. 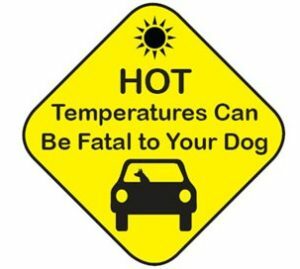 Parking in the shade will not make it acceptable for you to leave your pet in the car either. Pets can suffer from heatstroke just like people. Heatstroke can lead to organ failure and even death. Leaving your pet in the car can also lead to dehydration, which can cause all kinds of issues in your pet. We know that you love your pet and want to bring them everywhere with you, but they will be much safer and happier at home than in a hot car. Too many pets die every year due to being left in hot cars. Don’t let your pet be one of them!